The Indiana Supreme Court recommends against your attempting to proceed in court without the representation of a lawyer. The Court also recognizes the fact that in some instances people choose not to hire an attorney or cannot afford to hire one. Representing yourself in court should not be taken lightly, and there are many instances in which hiring an attorney is a good idea. In fact, we suggest that even if you use the forms provided on this site that you still talk with an attorney prior to submitting them to a court in order to achieve the best result possible. Before deciding whether or not to represent yourself, you should know what will be expected of you. The Court has created the video below to provide information about the court process and what your responsibilities will be if you represent yourself. 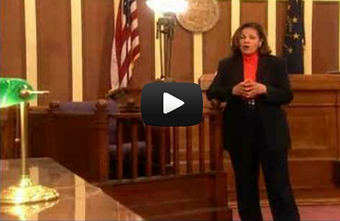 Remember that this video and the assistance offered by this website apply to civil cases. If you are charged with a criminal offense, the court can appoint an attorney for you if you cannot afford to hire one. A guide for unrepresented litigants developed by the Indiana Supreme Court. This video provides information about your responsibilities and the procedures you must follow if you choose to represent yourself. 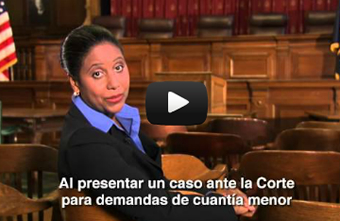 Two videos designed to inform you of your rights and responsibilities in small claims court proceedings: one for Marion County specifically, and one for courts throughout Indiana. If at any point you decide you need to seek help from an attorney—whether you just want to have your forms reviewed, have a phone conversation, or have a lawyer take over your case—there are many resources available to you. In fact, depending on your circumstances, you may even be eligible for low-cost or no cost legal aid. To learn about the options available to you, please see our page on Getting Legal Help. Can the court staff assist me with my case? The Court, including the judge, the clerk, and all court staff, must remain impartial. This means that they cannot take sides in any matter coming before the court. They will give the same types of information to persons on both sides of a case, but they cannot provide legal advice. Information you provide to staff is not confidential. Find out what the court can and cannot provide to you. Whether you are filing a case in a trial court or appealing a case that has already been decided, it is a good idea to learn more about how Indiana's courts work. Learn more at our Know Your Courts website or review our glossary of legal terms. In Indiana, the Courts are open to each and every person. Although there is no requirement that a person have a lawyer to go to Court, you are encouraged to see a lawyer to make sure you know your rights and all your legal options and to get the best result possible in your case. If you represent yourself, you must be prepared. Get a checklist of things to do before your court date and on the day of your court date.